EJBCA is the most popular open-sourced and enterprise-ready certification authority. It’s build on J2EE technology and scales well from small corporate installations to national PKIs with millions of issued certificates. Since version 6 it has a great UI to manage keys in a HSM. EJBCA uses the SUN provider for accessing hardware security modules via the PKCS#11 interface. As the SmartCard-HSM supports PKCS#11 via OpenSC, integrating with EJBCA is just a matter of adding the PKCS#11 module to EJBCA’s configuration. Want to give it a test drive ? Nothing easier than that - just follow the Ubuntu quick start guide, which should work for the majority of Linux distributions. You will also need to install OpenSC, either from the repository of your distribution or from source (the recommended way to get the latest and greatest). Enable the SUN PKCS#11 classes in JBoss (see under JBoss 7/EAP 6 PKCS11). To add the SmartCard-HSM and OpenSC to the list of recognized PKCS#11 modules, create a file web.properties in the conf directory of the EJBCA package. # If a library file's presence is not detected it will not show up in the Admin GUI. You might need to adapt the path to your PKCS#11 library accordingly. Crypto Tokens in EJBCA are key containers that can be shared amongst multiple CAs or other services like OCSP. They can be a software keystore or a hardware keystore accessible via PKCS#11. When you open the Administration page in EJBCA, then you should see Crypto Token in the CA Functions menu. Click on Create new… and complete the following dialog. Authentication Code is the PIN you assigned to your SmartCard-HSM during initialization. Using the Remove, Test and Generate new pair button you can manage keys on the device. to see if the PC/SC stack is working. 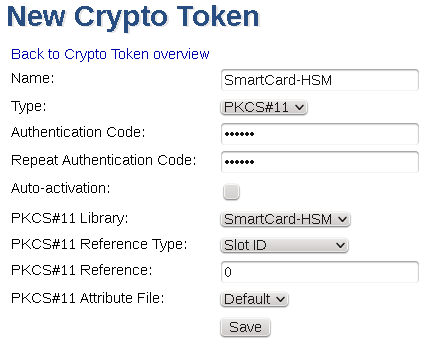 to see if the PKCS#11 module loads and find the attached SmartCard-HSM. If you can not select PKCS11 als token type, please check if opensc-pkcs11.so was added to web.properties and is found by EJBCA (see the log for details). If you experiencing stability issues (CKR_ARGUMENT_INVALID or SEGV), then those are most likely caused by a bug in OpenSC 0.14. If you see a CKR_GENERAL_ERROR when deleting keys, then most likely a bug in the SmartCard-HSM driver is causing the problem. The latest version of the OpenSC source has those patches integrated already.